Want to digitize your entire collection of DVDs or family movies? It’s simple; you just need the right tool. In addition to the tireless DVD burner, you will need the application that goes well. 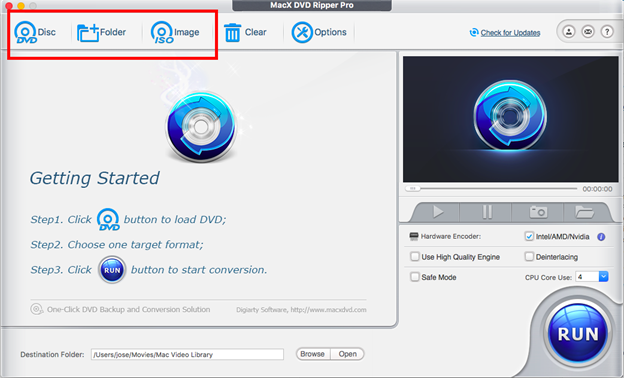 Here we are about MacX DVD Ripper Pro, which allows you to extract, convert and edit your DVDs to many video formats compatible with multiple devices on your computer without losing quality. Want to try it? From now till Feb 20, 2019, every participant who completes the 1-min survey can get a licensed copy of MacX DVD Ripper Pro for free and will have a chance to win iPad Pro, Netflix gift card and other prizes. Backing up a DVD is still an advanced and delicate procedure, that’s why you need the best DVD ripper for Mac. This is a fantastic application for Mac that will allow you to copy and rip DVDs also protected in multiple video formats. 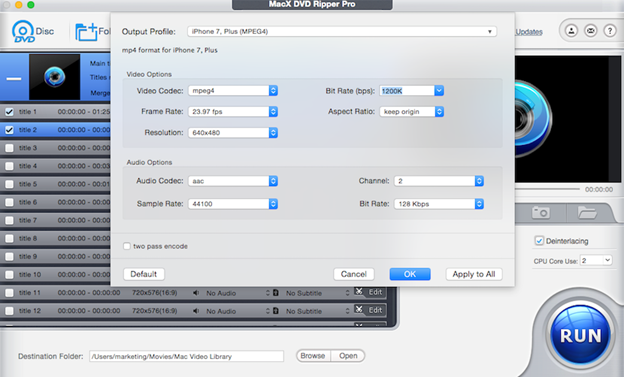 Why MacX DVD Ripper Pro is better than other software? Let’s face it, digitizing dozens and dozens of DVDs is an activity that can quickly become boring. So, be as efficient as possible. MacX DVD Ripper Pro is certainly the most powerful software on the market. It is one of the very few in its field to offer level 3 acceleration hardware. In other words, it is the only Mac application that is able to rely entirely on the GPU to perform all the tasks (decoding, video processing, encoding …). With this software, you will be able to extract your DVD or ISO images and then convert them to MP4, MOV, AVI, M4V, FLV or H.264 video formats. A menu also offers formats suitable for many devices such as the iPhone 5 and 6, 7, the iPad, Apple TV but also for consoles and tablets Sony and Microsoft. 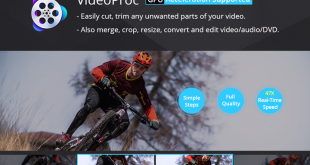 You will also be able to convert your videos to be compatible with YouTube, Facebook, and Vimeo online platforms. As a result, on a MacBook Pro, scanning a 2-hour Mac DVD takes only 5 minutes. 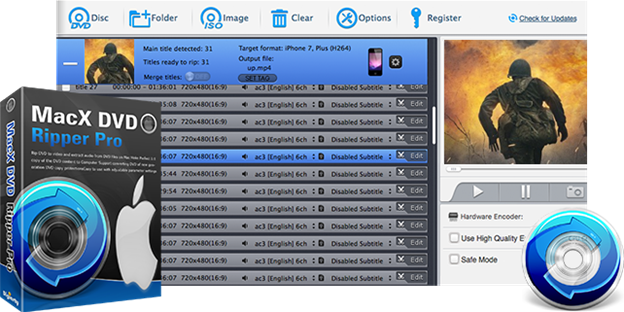 Not only is the encoding featuring extremely fast, but it has been designed to maintain maximum image quality. It can import everything (subtitles, different audio / video tracks …) and can encode all DVDs on the market, both commercial DVDs (with protections) and your family movies. It is also able to scan damaged files. 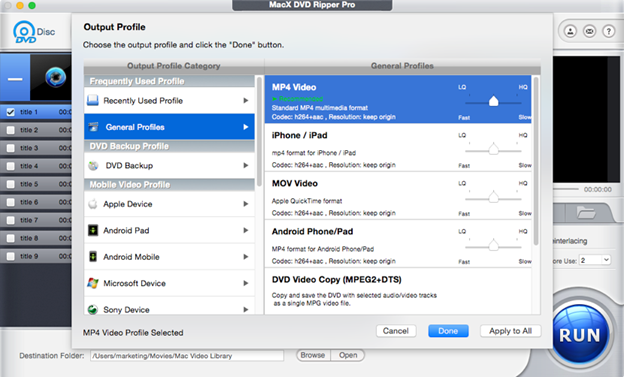 MacX DVD Ripper Pro is able to provide you the right settings depending on the device with which you intend to watch your movies, whether it is an iPhone, an iPad, an Android tablet, or even a PlayStation portable. With its 350 different profiles, it is very difficult to take MacX DVD Ripper Pro off guard. It is the fastest in the market. What advantages MacX DVD Ripper Pro offers us. The first and foremost is the speed of processing when converting video files to other formats. With MacX, ripping process takes only 5 minutes, with a maximum speed of 250-320 fps. This software uses batch conversion, all processor cores, and Intel QSV technology from Intel, to be able to carry out this task in so little time. 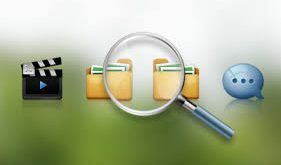 When converting a file to other formats, we must take into account the compatibility of the device that is going to play it, since the process takes just a short time to complete it. With MacX DVD Ripper Pro, we can convert any DVD to the most used and common formats, among which we find: MP4, H.264, MOV, M4V, HEVC, QT, AVI, MPEG, FLV, MKV, M4V, MTS, M2TS, and ISO, among many others. It is also compatible with MP3, ACC, and AC3 audio formats. If we talk about compatible devices, thanks to this application, we can convert our favorite DVDs or just any video file to be played on any model of iPhone, iPad or iPod touch, in addition to any model managed by Android manufactured by Samsung, HTC, Huawei, Google, Sony and even the models managed by the reviled Windows 10 Mobile and Windows Phone. 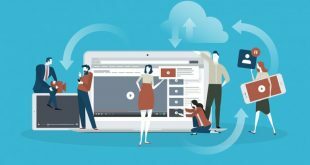 If we do not know the ideal format of each device, something quite common, the application allows us to select which will be the model that will play the content, from a long list of devices, so that the conversion is done adapting to it and that we do not face any problems during playback. You can convert all kinds of DVD. In addition to the oldest movies we have at home, this is the only ripper that exists to date that is capable of ripping the latest DVDs that contain content from television programs, or even those that are damaged and cannot be reproduced, it is capable of ripping your information. A very good extraction speed. The latest update has optimized the conversion speed up to 5 times more than the old version, reaching 250-320 FPS. To give you an idea, in 5 minutes you can convert a DVD without there being loss of quality. All video / audio formats and multimedia devices available. With the widest output profiles, convert DVD to all popular video and audio formats, such as MP4, H.264, MOV, M4V, AVI, MPEG, FLV, MP3, etc. It also prepares DVDs for playback on iPhone, iPad, iPod, Android, PSP or Kindle among others. In addition we can store them on our Mac or hard drive. 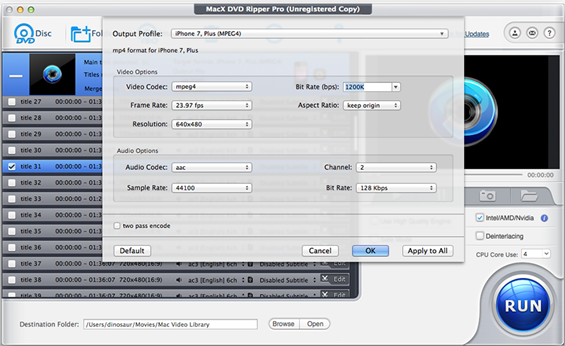 MacX DVD Ripper Pro is receiving updates to avoid all DVD protections that may exist. With this we will not have problems to run into an encryption, as this app will automatically remove it. Convert your DVD to ISO. Something that has impressed me about this application is how easy it is to manage. This is because it has a very clean and intuitive interface. You do not need to miss out on a bunch of menus to perform an action with your DVD, since when you enter the top you have a series of buttons with the main options, which is the information you want to rip. We can select a disk, a file from our Mac or hard disk or a virtual image. After selecting the file, choose which format we want to transform it and click the button in the lower left corner “Run” so that the program starts to make the transformation. Win iPad Pro and more gifts, when you buy the latest version of MacX DVD Ripper Pro license. Just complete a 1-minute survey (for computer users) or submit a valid email address (for mobile users) to get a licensed copy of MacX DVD Ripper Pro free and win prizes by sharing the campaign on Facebook. The competition will remain active until February 20th, 2019. What are you waiting for to try this wonderful software to rip DVD to MP4 without errors?